These cards were made for the Ditzy-Craftymessers vintage-themed swap. I like these cards because of what I believe is a great effect from using a combination of embossing folders and distress inks, together with gold and clear embossing powder. I think that the aged, worn and distressed effect has real impact. Thank you, Angela, for sharing a couple of your favourite artist trading cards with us. Although we like to see all kinds, the "aged, worn and distressed" look of your cards fits particularly well with the theme of our site. We were disappointed that you didn't tell us a little more about how you made them. 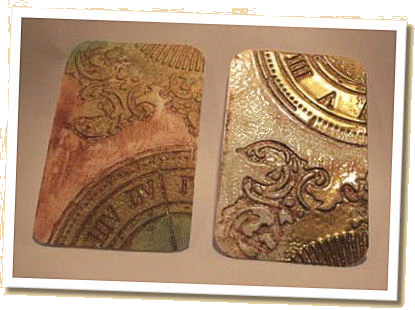 We see that you used the 'Renaissance' embossing folder from Couture Creations to give the appearance of an old ormolu clock. Ormolu (from the French "or moulu", signifying ground or pounded gold) is an 18th-century English term for applying finely ground, high-carat gold in a mercury amalgam to an object of bronze - Wikipedia. Anyone who would like to know more about the techniques that Angela used to make these artist trading cards can find an account on her blog at Tintin Heart.